Committed to providing seasonally fresh and flavorful Italian cuisine honed in the Piemonte region where she was born, Il Palio Restaurants Executive Chef Margherita Aloi recently enhanced the Shelton restaurant's dining experience by offering its extensive wine list on the iPad. Utilizing ‘Restaurant Wine List for iPad’, restaurant patrons are able to pair Il Palio's wines with Aloi's creative and tasty dishes, which feature her signature homemade pastas, seasonal produce hand-picked from Jones Family Farms in Shelton and the freshest spices and ingredients. Pereira developed the app with his brother, restaurateur Bob Pereira, COO of New York City’s Metronome Hospitality Group, and Sandra Frank, also of Metronome. With a smile, though, Pereira admitted that he has encountered a few patrons who are hesitant about using the latest technology to access information about Il Palio's wine list. Before partnering with Bob Scinto at Il Palio, the couple helmed Aloi Restaurant in New Canaan, where they reside with their daughter, Ariana. For three consecutive years, this popular eatery was named “One of the top three restaurants in Fairfield County”, and in 2004, Aloi was recognized for having the “The Best Wine List” in that region. In addition to the obvious appeal the app has for restaurant owners, wine enthusiasts are also invited to purchase Restaurant Wine List for iPad for their personal wine collection. Since its debut, the app, which allows up to 1,000 wines, has been downloaded by restaurants and wine connoisseurs around the world. With a simple download through http://winelistpro.com, users can customize the theme, upload their restaurant’s logo, update their wine inventory and edit their list anytime they like. Il Palio Restaurant, located at Five Corporate Drive in Shelton, is open for lunch Monday to Friday 11:45 pm to 2:15 pm and dinner on Monday to Saturday from 5:35 pm to 9:15 pm. For more information about Il Palio, go to http://ilpalioct.com or call 203-944-0770. 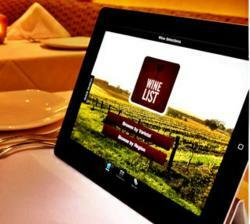 For more information about Restaurant Wine List, or to download, go to http://winelistpro.com.